Hot Tub Covers & Spa Covers Custom-Made For YOU! Select your spa cover shape. Our spa covers feature the required labeling and, when manufactured with four or more tie-down straps, are built in accordance with safety specification ASTM 1346-91. Our Best Thermal Guardian spa cover models are covered by our 5 Year Warranty. Standard model has 2 Year Warranty. Ultra model has 3 Year Warranty. Additional shipping costs apply to addresses in AK, HI, WY, ND, SD, NM and MT as well as limited access areas such as dense urban centers, off-shore islands, mountain regions, and remote locations. Our insulating, tapered foam cores are strong, energy-efficient and will shed water. The best performing vinyl covering fabric due to its superior strength and UV resistance. 12oz. Double-laminated. Treated and tested for chlorine, bromine & ozone resistance. Double-wrap your foam for more protection. Industry-leading thickness & protection. Helps keep the moisture getting into your foam cores. Our covers come with all the hardware you need to install it. Broken clip? Don't worry. It's all included with your new spa cover. Our steel support beams are 2.5" wide and offer maximum strength to discourage bowing. 93# UV and mildew-resistant polyester industrial thread keeps our covers stitched for years. Our covers are manufactured to meet or exceed ASTM 1346-91 for manual safety covers. Why buy a Thermal Guardian spa cover from America's SPA-MART? Our Thermal Guardian Premium Spa Covers are great looking! Are you buying from someone that knows spa covers or someone telling you what you want to hear? We know about covers because we have marketed and sold them for a long time. We offer a variety of densities and tapers to give you more of a selection of price to functionality. Our spa covers are tapered so the rainwater runs off your cover instead puddling on it. We highly recommend our Thermal Guardian models because they feature 2 " of fall instead of only 1" found on offerings from other retailers. Our SpaLux vinyl has been specially formulated for the rigors that outdoor spa covers face. Exceeds the specifications of premium marine-grade vinyl. Thermal Guardian spa covers exceed the specification for center-deflection perimeter rescue and the safety labeling requirements of ASTM F1346-91. Some jurisdictions are requiring that spa covers be manufactured in accordance with these guidelines. A spa cover is the sum of its parts. If you use good materials in the manufacture of a spa cover, you will get a good spa cover. In over 20 years of spa cover manufacturing, our manufacturer has found the finest materials available to build our covers. From the UV-treated thread to the industrial zippers and the premium SpaLux vinyl to the virgin EPS foam, Thermal Guardian premium spa covers are manufactured to the highest quality standard. The recipe for a great, long-lasting spa cover is simple. You start with Premium Materials. You acquire Superior Technology and assemble a team of experienced Quality Craftsmen and women who are paid to care what the product looks like. 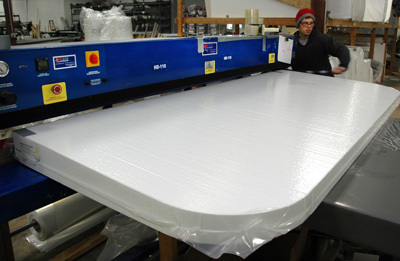 The watertight vapor barrier is sealed with a 9' long computer-controlled impulse sealer that makes a seal second to none. It is drastically better than foam cores sealed with small, undependable hand sealers. Our covers' patterns are cut by Otto. That would be the computerized cutter that doesn't make a mistake within a 1/1000th of an inch. There aren't computers that sew the cover, but even better a team of seamstresses tailor your cover to the fit you require. Our custom made-to-order spa covers are all specifically crafted for you and typically ship in 4 to 10 weeks. Need it faster? We offer a Rush Service so it ships in no more than 3 days! Since 1983, we have literally made hundreds of thousands of covers. We are so proud when someone takes time to send us a note expressing how much they like our work. Here are just few of the testimonials we've received over the years. Love Our New Spa Cover! Just wanted to take a moment to thank you for your prompt delivery of our new spa cover. The cover looks great . fits perfectly and greatly enhances our hot tub. Great doing business with your company and i would gladly recommend to anyone looking for a quality product. I received my spa cover, in good shape, yesterday. It's quite handsome and fits my spa well. Thanks so much for a well made product. It's lighter than my old one which will save my back when have to take it on and off to use the tub. Thanx a million! I had ordered a Spa Cover from your company a few months ago, and am quite pleased with the product and service I received. Thank you for your great work! I am very pleased with the cover and it seems to be a better quality than my last cover. Thank you! Best Spa Cover I've Owned! I received my new hot tub cover last week and it's great! I just flopped the new cover on and latched it. ( I saw from your website that you use the same latches as my existing cover.) I am very pleased with my purchase and plan on coming to your company again when the next replacement is needed. I received my spa cover today. I am pleased with the quality of the construction and the dimensions are perfect. Thank you! Thank you for the great service and timely delivery of my spa cover. The size was perfect and the quality is outstanding. It is great to get service from an online order....thanks again. Just wanted to drop you a quick note thanking you for my new hot tub cover. It fits like a glove. Very happy with the color and craftsmanship. Again thanx for a great product. Received the cover today. It fits perfect. Good job. Thank You. I received my cover today and installed it on my tub. I want to thank you for a wonderful product. It fit perfect, the color is great, nice and light, Nice material and the price was great. Great job and I look forward to buying my next product from your company! Thank you. Just wanted you to know that the pool table cover is perfect. Thanks. My wife and I are very happy with the spa cover and the lift arm we purchased from your company. Thank you for your fast delivery. We received the pool table cover yesterday and it fits perfectly! Thank you. I want to thank you for the very satisfactory experience I had purchasing a spa cover. The cover arrived in exactly two weeks from the time I placed my order. It looks nice, is very well made, and the fit is fine. The Thermal Guardian BASIC spa cover is an economy grade product targeted for use on spas that are indoors. It is NOT WARRANTED for outdoor use. Only available in BROWN, 2" skirt and 2 straps. Wondering what all those stars and the length of the red bar mean? It's just a way to communicate to you the differences between our models. We suggest you use these pictograms as a guide to choose among the varying spa cover base models that we offer. Think of them as comparing one Thermal Guardian model to another. Prices valid on sizes up to 96" x 96". Additional charges may apply for special cover features to accomodate speakers, headrests, handrails, etc. Free delivery is to qualified addresses in the continental United States. Restrictions apply. Additional charges apply to locations in Hawaii, Alaska, Washington, Oregon, Wyoming, Idaho, Montana, Utah, New Mexico, North Dakota, South Dakota, New York City, Miami FL, remote locations or offshore islands. Click here for more information on our spa cover free shipping policies. * 5 Year Warranty not available on the Basic nor Standard spa cover model. ** 30 Day Money Back Guarantee is subject to our sales terms and conditions.